Carrizozo is a small railroad town in southern New Mexico surrounded by mountains to the East and White Sands Missile Range to the West. I visited there last December and was fortunate to meet Paula Wilson and Mike Lagg, the founders of MoMAZoZo, an art space located in Downtown Carrizozo. 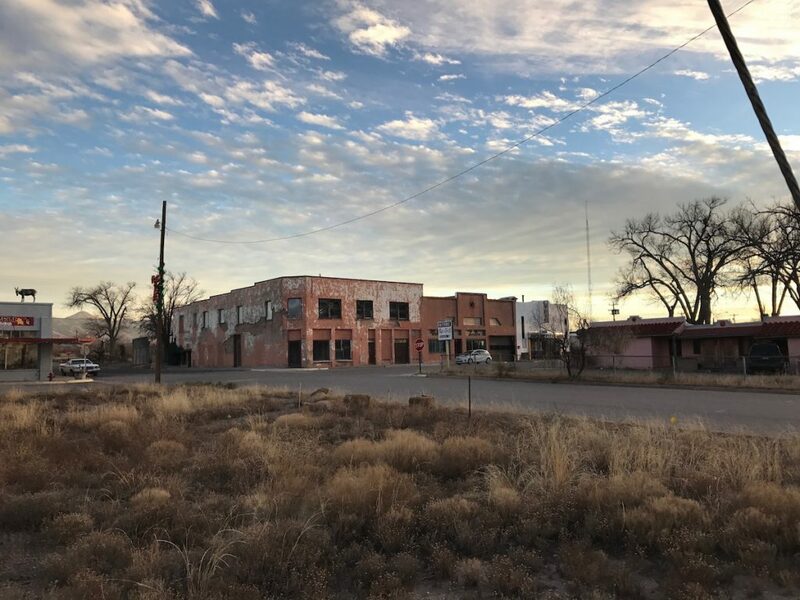 Mike and Paula have been developing a residency program over the past several years to bring artists to Carrizozo, where they can find both solitude and engagement with the community, history, and landscape of South Central New Mexico. The following interviews looks into the history and future of MoMAZoZo, and the dynamics of art spaces in small towns. 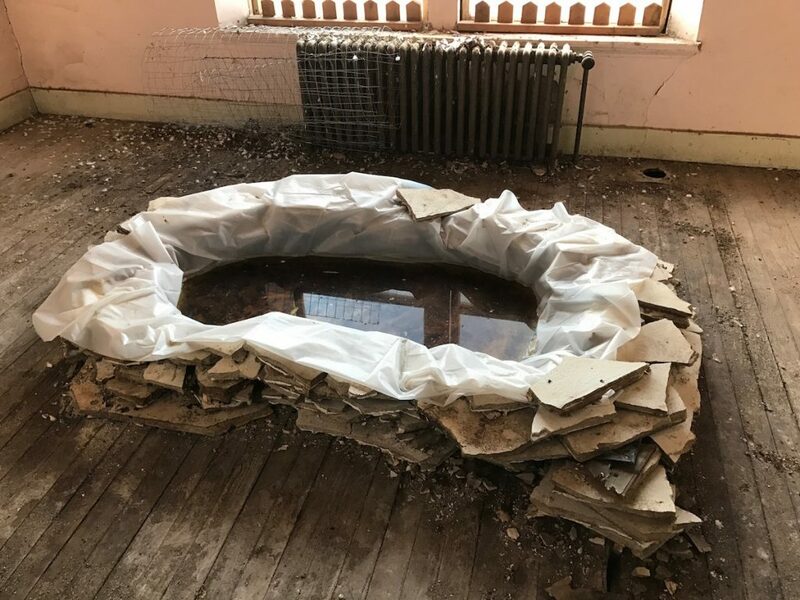 It also offers a glimpse into how artists are incorporating structures from art institutions, such as that of a residency, into their own practices. Spencer: First, I’d love to get a little background and timeline for MoMAZoZo. How and when did it get going as an art space and as a residency? Were you following a specific vision in establishing it, or working intuitively as things progressed? Paula: Mike and I remember how MoMAZoZo began differently. I have a distinct memory of Mike coming up with the name in my studio while I was painting. It clicked– funny yet somehow accurate. Kind of like, let’s dream big and fill those shoes. It was more of an idea than a program, institution, or plan of action. It was about us joining forces. We aren’t married but have been together for 10 years, so it represents our union– our idea, our coming into being and the meeting of our minds and artistry. I made a poster for MoMAZoZo. A picture of a cube in the desert or an empty blank space. That was the start for me. 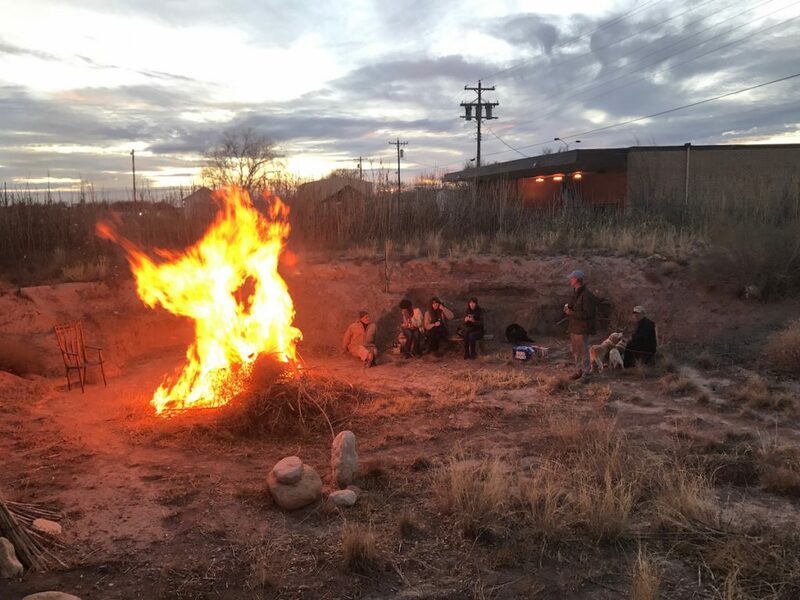 Winter Solstice bonfire this past December. Mike: What I remember is that we were offered a free space on 12th Street in Carrizozo. Large, abandoned, and unencumbered. We proceeded to it make it MoMAZoZo. We made signs, we made pretzels, we made it a space to be visible. The MoMAZoZo hour is what made it possible. Paula: Our open hours have been consistent and unwavering from the start– Fridays, from noon to one. Mike: Except we are closed on Black Fridays for humanity’s insanity. Spencer: How did each of you come to Carrizozo? What prompted you to stay? Mike: Paula came here for the promise of a green chili cheese burger. I came here because of the cheap rent and I saw the opportunity of Carrizozo to be my art center. Spencer: I’ve been thinking a lot about my experience traveling down to Carrizozo. 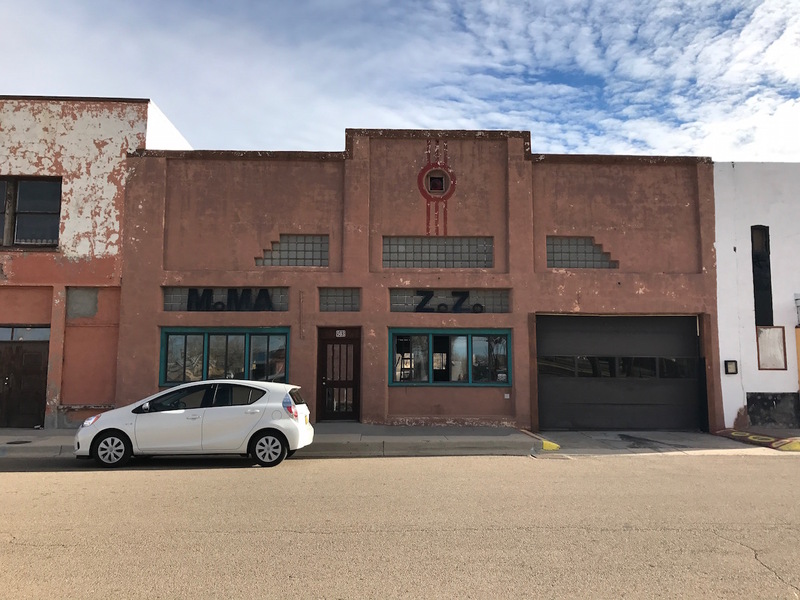 It’s a very specific experience, much like traveling to Marfa, or visiting Spiral Jetty: each highway, turn and small town you pass through adds to the meaning of the place you wind up. But that is my experience as an outsider, coming from an urban center. I think there is this urban-center/rural-periphery divide that dominates many narratives of the art landscape and privileges cities over small towns. What has been your experience of working in a rural town? Does this distinction hold up? Does MoMAZoZo operate as a periphery or a center? Paula: MoMAZoZo is definitely a center in the new global and virtual paradigm. Mike: It wasn’t until recently until we physically became the center of the art scene in Carrizozo with the purchase of the Lyric Complexu on Twelfth Street. It was an abandoned suite of buildings. Two of them were on the verge of being condemned. The third one, being Paula’s studio, was recently remodeled for a micro brewery. Included in this complexu are ten lots of open space. It is across from a park that is basically the center of Carrizozo with Twelfth street being the historic and artistic biway. So all told we have a 5,000 square foot studio and a two story abandoned hotel with lots of potential. Paula: Not to mention the Lyric Theater. I like how you talk about the experience of traveling here. We find ourselves at the spot near where White Sand National Monument meets the Valley of Fires lava flow. There is a tension of forces that give Carrizozo its vitality. A mix of liberals and conservatives, newcomers and old timers, preservationists and cattle ranchers. Spencer: I was struck by Paula’s comment that as visitors we sort of functioned like currency. I reflected on how laid bare a lot of transaction is in small communities: visitors bring income or extend networks or increase visibility. These transactions are not always so transparent in large cities, and aren’t necessarily intuitive either. Starting a residency seems like a good way to foster transaction and serve both artists and communities. What has been your experience so far running the residency? What have been some of the experiences of participants? Mike: We found that the residents of Carrizozo have embraced our Artists-in-Residences with open arms. Paula: It is the simple things, like when Sully volunteered to take Jemima back to the airport, or when Anya was able to procure bicycle tire tubes from Bill at the municipal airport. The need arrived and was satisfied without the exchange of dollars but just with good will. In Carrizozo we can privilege quality and diversity of human interaction. Paula: Yay. I wasn’t quite expecting the community to have such a stake and investment in our artist’s experience. And there is a reverberating impact that each visitor and artist has– recommending and bringing new people to the area… a network. The Carrizozo Colony AiR is a collaboration with Joan & Warren Malkerson. They provide the housing and studio spaces. We work together to make this thing sustainable and smooth operating. Mike: There is a community email newsletter and each artist has been getting a profile in the local paper. It is just the way small communities work and we try not to take it for granted. Mike: In most things, that an artist does, you basically are doing by yourself, because that is just the nature of the artist’s life. So when an opportunity does come along to collaborate, that is a special moment. Those are the rare occasions that you gotta jump on. Because two people working together have the exponential power of creative force. Mike: … but that is really not that important sometimes. Mike: … our wooden spoons. Rain catchment in the desert. Spencer: Looking forward, what is on the horizon? Paula: We have been blessed by support both within and outside of Carrizozo. Currently a New York collector of mine, who visited and loved Carrizozo, is funding an Executive Director position. We are welcoming 13 artists in 2017 for the Carrizozo Colony Artist-in-Residence. We look forward to hosting lots of events in the Lyric Theater. Mike: So far I have been tearing down the fences along our new properties. I look forward to more openings, more access, and more diverse collaborations. Paula: Yes! And visitors. Please come visit us. To visit: LYRIC COMPLEXU on Twelfth St in downtown Carrizozo 503 12th St, Carrizozo, NM, 88301. The MoMAZoZo hour happens every Friday from 12pm-1pm.